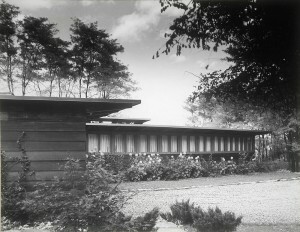 Don Hershey designed this home in Pittsford for Glenn and Norma Mentch in 1950-1951. It is now on the market and is a classic Hershey that must be seen. Go to this page for more photos and a description and memories of the home from members of the Mentch family. Go to realtor page. Update: This house sold for $205,000. I believe the house is under contract. I looked at it last month and passed on it. It’s been terribly neglected by the current owners and needs extensive restoration. Hopefully, the new owner(s) will be able to restore it to its former glory. Yes, an offer was made and accepted. I too hope that the new owners will be able to restore it to its glory without making too many changes to the unique architectural design!